CHICAGO (Nov. 17, 2016) – For its dedication to improving the lives of LGBTQ Illinoisans, Equality Illinois will honor the Ann & Robert H. Lurie Children’s Hospital of Chicago with its Business Leadership Award. The recognition will be made at the Equality Illinois 2017 Gala, the Midwest’s largest LGBTQ formal celebration, to be held on Saturday, February 4, 2017 at the Hilton Chicago, the organization announced Thursday. More than 1,400 attendees, including more than 100 political figures and community VIPs, are expected to celebrate the accomplishments that advanced LGBTQ rights over the last year and hear a call to arms about the challenges that remain in our fight for full equality for all Illinoisans. The Gala will also mark the beginning of Equality Illinois’ second quarter century of service to LGBTQ Illinoisans. 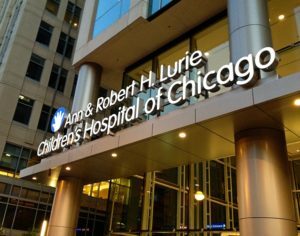 “What better way to launch our second 25 years than to honor Lurie Children’s Hospital for its belief that LGBTQ people must be treated with dignity and respect and afforded the level of care and service that is needed for them to live full and equal lives,” said Brian C. Johnson, CEO of Equality Illinois. The Equality Illinois Business Leadership Award, given last year to Mariano’s grocery chain, is awarded annually to organizations that demonstrate remarkable vision, courage, and leadership in the effort to achieve full equality for LGBTQ individuals in Illinois. Johnson said that Illinois’ 2015 ban on conversion therapy in Illinois was achieved, in part, due to Lurie’s advocacy work done by their Division of Adolescent Medicine. Lurie’s groundbreaking Gender Development Services provide cutting-edge, world class, and affirming services for transgender youth and their families. Lurie’s HIV/AIDS Prevention Program serves more young people than any other similar provider in the Midwest. “In fact, our 2017 Gala coincides with the 30th anniversary year of the founding of the HIV/AIDS Prevention Program at Lurie,” Johnson said. More honorees and details about the Equality Illinois 2017 Gala will be announced in the weeks ahead. Tickets and more information about the gala are available at www.equalityillinois.org/2017-gala.